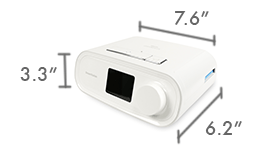 The DreamStation CPAP machines without humidifier are 7.6 inches wide, 6.2 inches long, and 3.3 inches tall, and weigh 1.6 pounds, making them smaller and lighter than the former models by Respironics, the System One series. 1. CPAP: which is the base level single-pressure machine. 2. 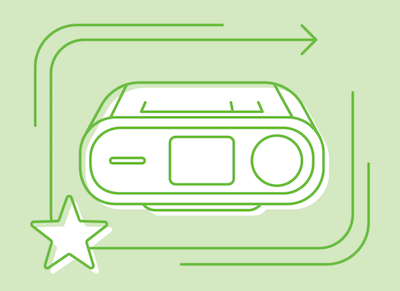 CPAP Pro: a single-pressure machine with more advanced features. 3. Auto CPAP: an auto-adjusting single pressure machine. 4. BiPAP Pro: a non-adjusting machine with two distinct pressures for inhalation and exhalation. 5. Auto BiPAP: a machine that will automatically adjust to provide two distinct pressures. The machines feature a front-facing colorful display with an easy-to-use dial for navigation of menus. There is an ambient light sensor on the top of the machine which allows the display to automatically change brightness depending on light levels in the room. The machines have SmartRamp, a ramp option that will allow the machine to stay at a lower pressure until events are detected. If the event requires a pressure higher than the current ramp pressure, but lower than the prescribed pressure, it will increase to that pressure and maintain that pressure until ramp time is completed, or until an event occurs requiring a higher pressure. When the ramp time has been reached the machine will increase to the prescribed pressure or to the minimum pressure range if it is an auto-adjusting machine. ・Flex technology to decrease pressure on exhalation. ・Automatic on and off to start or stop therapy when the mask is put on or taken off. ・Mask Fit Check on some models to ensure the mask is sealing well. ・Regular reminders to check and replace filters. ・Bluetooth capability to connect to the DreamMapper app. The filters for the DreamStation CPAP machines are tray style and slide easily into the filter port on the side of the machine. The machine will come with a darker blue filter installed which is washable and reusable, and one light blue disposable filter which will come uninstalled and can be added if desired. Also available is the optional heated humidifier which connects directly to the machine to provide warmth and moisture to the air. The humidifier adds to the ease of use with a dishwasher safe chamber that is simply set inside the humidifier and then closed to be ready for use. The humidifier has a pre-heat option so that the humidifier can begin heating 30 minutes before use to increase initial comfort of therapy. 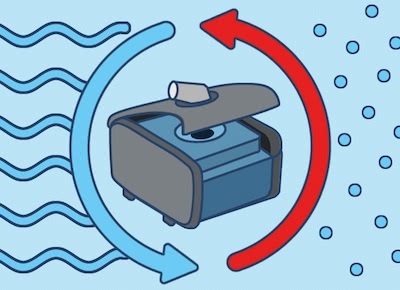 The humidifier can be set in a traditional mode with a fixed heat setting during the night, or can be set in Adaptive mode which will monitor the ambient humidity and adjust the heat settings as needed to provide optimum humidification. The optional heated tube can help further increase humidity comfort by keeping air warm all the way to the mask. The heated tube is a slim style tube with a 15mm inner diameter. When the heated tube is connected, the machine will automatically detect it and adjust the tube setting to the 15mm option. The DreamStation CPAP machines come with a reusable filter installed, a disposable filter uninstalled, user manual, power supply and cord, standard hose, and carrying case. The humidifier and heated tube are optional and can be added when ordering. To view more information and features of the DreamStation CPAP machines and accessories, view the full introductory video on CPAP.com or give us a call at 800-356-5221. 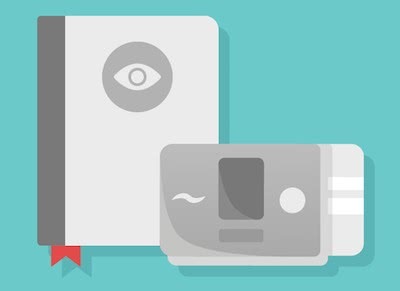 To help you make sense of CPAP machines like the Philips DreamStation, we’ve created the following comprehensive guide to CPAP machines. There you’ll find out more about how CPAP machines are being used to help patients overcome Sleep Apnea. We’ll help you make sense of features and options, and provide helpful information as you journey towards CPAP success. Chris has been involved in the CPAP world since 2012 and has immersed himself in learning about Sleep Apnea and the CPAP options available for users. Chris has become knowledgeable about machines, masks, and accessories and keeps up to date with new, innovative products. I really like how a cpap machine can really supply a constant and steady air pressure to help you sleep at night. Sleep apnea is a very common problem that a lot of people don’t realize that it can be treated. 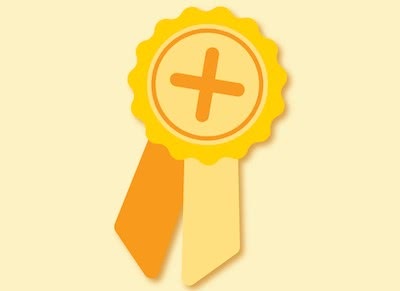 For many years my wife has complained about my snoring and I finally got it check out. Thanks for sharing this article because my doctor told me I had this and I wanted to learn more about it. May I know where we can order 1 unit of Philips Respironics Dreamstation Auto CPAP without heated Humidifier (New Model)? If I order online how long it will take to be delivered in Philippines? Who will I contact to order 1? Unfortunately we are unable to ship Philips Respironics machines outside of the US due to manufacture restrictions. If you have any other questions please call +1 713-351-3414 if you are calling from outside the US. Or, 1-800-356-5221 if you are dialing from within the US. I have tried multiple mask, without success. The respiration rate does not match mine and have not been able to adjust. Can anyone tell me if it is programmable to match my respiration rate? If you breathe very slowly like I do, 6-8 breaths per min asleep your provider can either adjust it for you or unlock additional settings for you to be able to match it to your breathing, when I started I breathe so slowly that my machine was constantly trying to force me to breathe thinking it was an apnea. Heated tube keeps coming loose at the point it connects to the mask during sleep. Will stop using it and go back to standard tubing. I am having a terrible time with mask leaks using my DreamStation. Last night the Mask Fit was only 13% but I never felt any leaks before sleeping or when I woke up. I use high pressures. 90% or less averages are 20 & 15. Unfortunately you cannot shut it off manually, but the back light will shut off after a bit of time has passed. Think of them as sunglasses for your LED displays. Hope that’s helpful. Feel free to reach out with any other questions, by phone at 1-800-521-3556 or by email at CPAP@cpap.com. I have the Dreamstation. Does it have a night light. Having issues finding the on/off switch in the dark. My DreamStation DSX600H11 BiPAP Pro light on the front panel is FULLY BRIGHT in the dark – the auto sensor is not working or is not on. IS there a setting for brightness in the menu or hidden menus? Sorry to here that you are having trouble with your machine. The light adjustment should be constantly on and I don’t believe there is a way to turn that on or off. Sounds like you may have a faulty light sensor. If you purchased your machine from CPAP.com then we can work with you on your machine warranty. Feel free to call 1-800-356-5221 for assistance. will this work in the philippines with 220volts? Yes, with the appropriate power plug adapter the DreamStation will work with 110/220volts. My sn is J163293960043, what machine do I have, I think I am supposed to have the auto cpap. Unfortunately I would need more information than that. You can go ahead and email us at CPAP@CPAP.com with more information and someone should be able to help you out. It seems to me that increasing humidity will REDUCE air flow in some people by clogging the nasal passages with moisture. Increasing humidity will increase rainout – which is actually excess water, or condensation in your hose. Some people experience the build up water flooding into their mask as well. For this, we recommend a heated hose or a Snugglehose which basically acts as an insulator. But to speak to clogging nasal passages, I’ve not heard that be an issue. I have a Phillips Respironics Dream Machine CPAP with heated hose. Is it possible to turn the heat completely off or at least to the lowest level? It is too warm for me & I don’t know how to adjust it. Can you help? Thank you for reaching out to us regarding the DreamStation humidifier. The humidifier offers 5 levels of humidification, one of them being 0. To turn off the humidifier, you will need to select the 0 heat setting with the machine dial. Also, make sure the heated tube is not being used as this will put the machine into Heated Tube Humidification Mode. If you have any other questions, please feel free to contact us at 1.800.356.5221! I hope this information is helpful! I have a bipap dreamstation. Is there a way for the respiratory tech to slow the repiratory rate. It is too fast for me and I feel like I am hyperventilating and can’t get to sleep when I use it. Also is the air pressure (15/10) supposed to blow my cheeks out like a chipmunk when I mouth breath? I can’t rest when my cheeks keep getting blown-out every few seconds. Am I wearing the mask incorrectly? I wear a size small in the mask series I am using. Hi Bibi, please contact our CPAP specialists at 1.800.356.5221. We would be glad to assist you in finding the appropriate pressure for your sleep therapy! Thanks! How do I find out if my dreamstation is capable of auto pap as well as cpap? My average 30 day ahi is 4.9. I also have some csa. I tried bipap but couldn’t sleep . I was always trying to anticipatin the breath..some of my nights I have ahi of 9.my sleep study was 24.7 ahi. My next appointment is march. Should I be happy with my current success? If your AHI is less than 5, you’re making progress. An AHI lower than 3 is really good. I find that sleeping on my side helps open my airway, and my machine doesn’t need to work as hard. Ultimately, sleep is really personal and you just need to find a position, machine, and mask that works for you. My father has a DREAMSTATION CPAP MACHINE w/humidifier. He is convinced someone told him that should wear it while he’s watching TV before he goes to bed- While Fully Awake ! If an individual is having trouble getting used to their CPAP at night, then we do recommend wearing it before bedtime to help them get acclimated to the new feeling. However, if your father is comfortable with his DreamStation, then wearing it while watching TV is not necessary. I use my Dreamstation machine as a “bipap” and have recently had an issue where the amount of hours registered on the machine are considerably different than the number of hours actually used. I have cleaned the filter and unplugged the machine to reset it, but the problem still exists. Is there anything else that I can do to eliminate this issue? ?